This post will hopefully literally take fifty seconds to write. My camera is packed ready to go for camping this weekend, so we will have to make due without. Last weekend I managed to acquire a jar of beets. Now, never of my own volition have I purchased such a product, but when freely given, I feel like they must be put to use. What would you do with some water-packed ruby red roots? Well, I decided they would set well with most of the other fruits and veggies I currently have on hand...in a smoothie! Ok, don't cringe. It is really rather tasty! This bright red beverage has a slight hint of beet, but is mostly an amorphous earthy sweetness. I just placed everything in the cup that came with my immersion blender. Pulsed until smooth, without large bits of spinach. And that was that! Check out this and other recipes on Wellness Weekends! 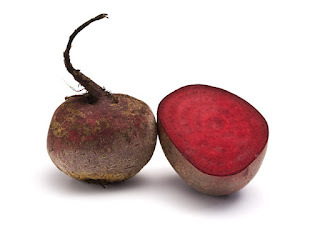 I love beets but never thought of them in a smoothie. They taste sweet to me although others think they taste like 'med'. What a difference in perception. This is a must try!